Highlights from the MLS Cup final as Atlanta United beat the Portland Timbers 2-0 to win the title in their second season since being formed. 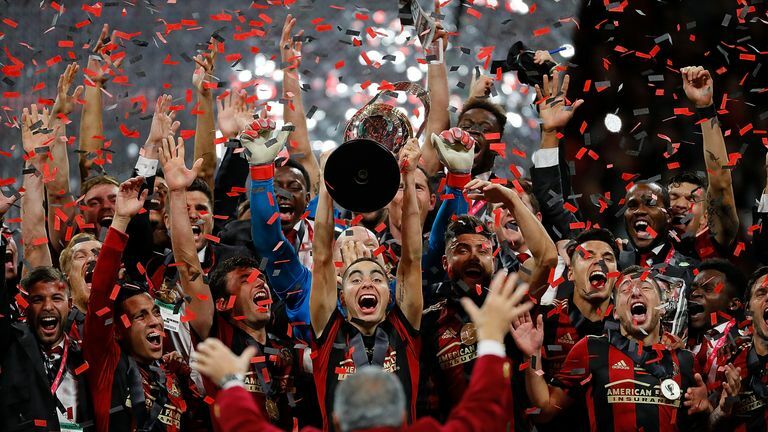 Atlanta United won the Major League Soccer title in its second season of existence, defeating the Portland Timbers 2-0 in the MLS Cup final on Saturday. Atlanta's MLS Most Valuable Player Josef Martinez led the way in front of a league-record crowd of 73,019 at Mercedes Benz Stadium, opening the scoring in the 39th minute with his 35th goal of the 2018 campaign. Argentine defender Franco Escobar doubled the score in the 54th minute as Atlanta made coach Gerardo "Tata" Martino's last match at the helm a victory before he departs to take over as coach of Mexico. "If I had to choose a way to leave somewhere, this is the best way," a beaming Martino said. "We won it, it feels good," added Martino, who endured bitter Copa America disappointments with Argentina in 2015 and 16. Atlanta pressed from the beginning. Martinez was sent tumbling by a challenge from Larrys Mabiala in the penalty area but play was waved on and VAR backed up the call. Atlanta's Miguel Almiron had a clear chance in the 29th minute from a cross from Greg Garza but Portland goalkeeper Jeff Attinella dived right to swat the shot away. Ten minutes later Atlanta seized the lead as a sliding Michael Parkhurst sent the ball toward the penalty area and Martinez beat Liam Ridgewell at the top of the box then rounded Attinella to slot the ball into an empty net. Four minutes later Atlanta keeper Brad Guzan denied Portland's first real chance, set up by Sebastian Blanco's cross to Jeremy Ebobisse. Ebobisse's close-range header was pushed away by Guzan to keep it 1-0 at the interval. The Timbers pushed forward early in the second half, but found themselves 2-0 down after 54 minutes. Martinez won a free kick, then appeared at the near post to flick on Almiron's service into the path of Franco Escobar, who fired into the bottom corner. The contest boasted a distinctly South American flavour. Martino's opposite number at Portland was former Venezuela international Giovanni Savarese. Atlanta's squad featured eight players from South America and Portland's nine. Savarese said he was proud of his side. "It was not just Josef Martinez's game, it was a good game for his team, it was also a good game for us, I think everyone in the stadium has seen a good match today," Savarese said. "I would not change anything, I think we did a good job, I think we did not have the fortune to score at the right moments, I think our second half was fantastic, we fought a lot to try to achieve the result we wanted." Atlanta, who finished second in the Eastern Conference in the regular season -- denied the Supporters' Shield by Eastern rivals New York Red Bulls -- eliminated New York City FC in the quarter-finals and the Red Bulls in the conference final to reach the championship match. The club created by billionaire Arthur Blank, co-founder of the Home Depot DIY chain and owner of the Atlanta Falcons NFL team, succeeds Toronto as MLS champions. "First and foremost it's huge for the city," said Guzan, of Atlanta's first major pro sports title since the Atlanta Braves won the World Series in 1995. "For me personally, this is up there with the top moments. You never know if you're going to have this opportunity again. "We knew at times we were going to have a lot of possession. It was a matter of finding the first goal and opening them up."